Sarah Koenig and the Serial podcast took the country by storm when they first broadcast the story of Adnan Syed and his alleged murder of his former girlfriend Hae Min Lee. Quickly, I saw teachers on Twitter chat about using the podcast in the classroom–some as a form of literature to analyze, others as a way to meet listening standards. As for me, I’ve used the case in the past few years as a springboard for argument writing. This year, I also included the Curtis Flowers case, highlighted on season two of In the Dark, as another true crime option for students to analyze and discuss. After introducing argumentation with the game Superfight, I introduce the Adnan Syed case in a similar way as Sarah Koenig does in the podcast. I have a Google Form that asks students to give an alibi for three different times, ranging from the previous day to six weeks prior, which is the same amount of time between Lee’s disappearance to the discovery of her body. Always, the students become frustrated with trying to remember where they were, especially when I prohibit the use of their phones or social media (as high school students didn’t have them in 1999). This is an activity that sticks with them throughout the unit, and often I hear students from other classes asking me if they’ll get to do the same unit in the future! Together, we listen to the first episode. I also provide hard copies of the character map and some primary documents, such as the cell phone records and the Asia McClain letters, so students can peruse these as they listen. We stop occasionally and discuss. Some students take notes. At the end, everyone writes down three questions they want to know more about (this can work really well on a Padlet page, too). We then move onto the Curtis Flowers’ case. Again, I provide hard copies of evidence, such as a map of the crime scene and the transcripts of the cross-examination of Curtis Flowers, so students may peruse them while they listen. Once they’ve listened to episode 1 of both cases, they choose one to follow. I give them 3-4 school days to research. Some choose to “divide and conquer” by working as a team to find information and share with each other. Some students choose to work alone. From there, students plan on a graphic organizer, which I look over to be sure the foundation of their argument is solid. (A sample organizer that’s scaffolded for more struggling students can be seen here). Then, students draft their arguments using both primary and secondary sources. For more details of the unit, you can go here. It’s Real World. Not all students will become lawyers, but many will have to serve on a jury or participate in our legal system. All will have to make voting decisions based on analysis of primary and secondary sources. Mystery. A “Who-done-it” holds a fascination for students. They want to be the one who finds a piece of evidence no one has found or develops a new theory. Even months later, students still stop by to give me updates on the case. They’re still intrigued and following it! Primary Documents. Students have been using secondary resources since they were in the primary grades, but often we don’t emphasize primary sources. With cases like these, students can easily use both primary and secondary sources. Limited Choice. For most writing assignments, I choose the genre and allow my students to choose the topic. For our formal argument research paper, they’re more limited in choice, but they still have the choice of which case to follow. Being limited to the two cases provides for other opportunities. It’s much easier for students to work together and collaborate. During peer review, students are familiar with the cases and can provide deeper feedback about argumentation and counterarguments. The same can be same for me–being familiar with both cases, I can point out misconceptions students have or different angles they may want to consider in argument construction. Applicable for All Levels of Students. I use this unit for both dual credit College Composition and my struggling seniors. Both populations are drawn to the topics and the research. I simply provide more scaffolding and adjust expectations for the second group. I’ve used this unit with both juniors and seniors, but other teachers have found success with the Serial podcast even with sophomores. 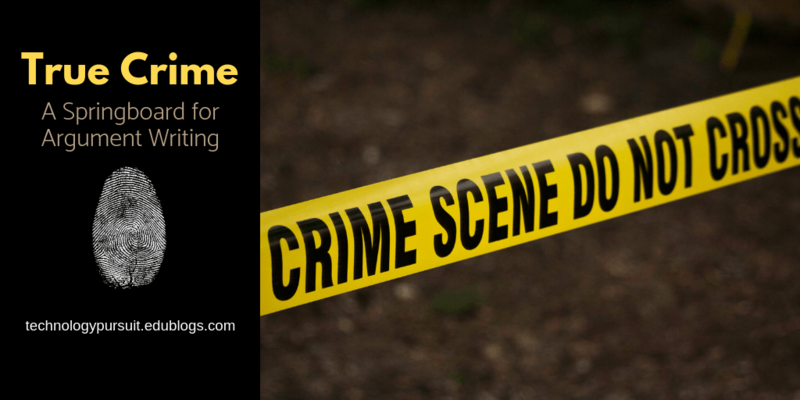 Even if a true crime angle isn’t your cup of tea, the resurgence of podcasts provide teachers even more resources to provide to students. With most students owning their own smartphones, it’s so simple for them to listen during long bus rides, driving in their vehicles, or sitting at home–all of these being places that my students said they’d listened to podcasts for this research project. I would love to try something like this. Can you share all of the details? We chatted about this via Twitter, but is there anything else we didn’t discuss?